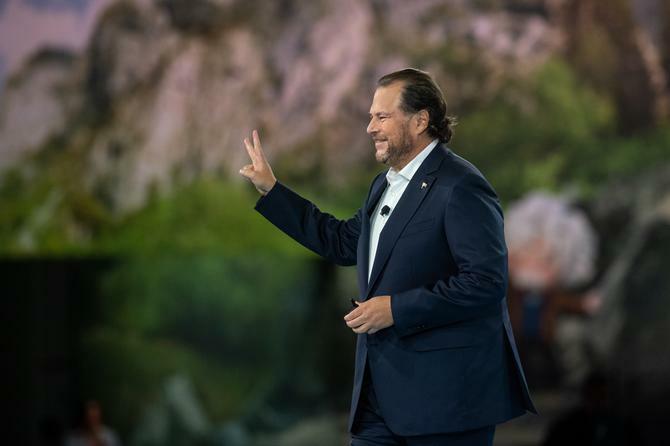 The fourth industrial revolution was front and centre at the official Dreamforce 2018 keynote , with Salesforce launching a number of new applications to better enable what they consider to be at the heart of this new revolution: Connection. Salesforce chairman and co-CEO Marc Benioff, said technology is neither inherently good nor bad; it’s what you do with it that matters. 'Inclusive capitalism' requires every company to ask themselves if what they are doing is ethical and humane because business is the greatest place for change and no one should be left behind, he said. In the Fourth Industrial Revolution, the key to success is your connection with your customers, Benioff said. “This is an important time for the world, where we are taking personal action to change the world. We are not relying on your government leaders, or NGO leaders, or business leaders. We are coming together to work as one," he told attendees. “Everything is starting to get connected. And behind all of these things is the customer. We’ve been building our customer success platform for almost 20 years so that companies can be connected to their people, products, and their customers. “We must ask, what is your highest value? In a world where technology is taking us over, we all have a higher responsibility to ask that question, especially as AI gets released into the world. We have restructured our company to have an office of ethical and humane use of technology, and every CEO better be ready to answer that with their values." Prior to the keynote, Salesforce announced a strategic partnership with Apple, which sees Apple iOS and Salesforce’s CRM will be brought together to facilitate new mobile apps for business. Benioff also revealed the Philanthropy Cloud, and launched new advancements in the vendor's overall cloud proposition including Customer 360, Mulesoft’s Anypoint Platform, Einstein Voice and Quip Slides. Salesforce Customer 360 aims to deliver unified cross-channel customer experiences by moving beyond an app or department-specific view of each customer by making it easier to create a single, holistic customer profile. “As consumers, we know when a brand has gone the extra mile to deliver an amazing cross-channel experience, but creating that single view of the customer is extremely challenging for any company to do consistently,” Salesforce president and chief product officer, Bret Taylor, said. “Customer 360 will make it easier for companies to bring service, commerce and marketing together to deliver the unified experiences that their customers demand, using clicks, not code." Customer 360 comprises a set of platform services to enhance data management across Salesforce apps, including click-based UI for app and data management, reconciled 360 ID and profile across apps, and pre-built packages for Service, Marketing and Commerce clouds. Integrated with this is the MuleSoft Anypoint Platform, which Salesforce acquired in March this year. To obtain a more complete view of the customer, companies must access customer data from systems outside Salesforce. To accomplish this, Salesforce customers will be able to implement API-led connectivity across any application, data, or device with MuleSoft Anypoint Platform, and then connect these APIs directly to Customer 360. The popularity of voice was also recognised with Einstein Voice, which aims to help users talk to Salesforce to work smarter and more productively. With Einstein Voice Assistant, people can get personalised daily briefings and talk to Salesforce via the Salesforce Mobile App or the smart speaker of their choice. Einstein Voice Bots let admins build customer facing bots connected to Salesforce with clicks, not code, creating new ways for companies to interact with their customers. Amazon Web Services (AWS) and Salesforce also expanded their global strategic alliance announcing new product integrations that aims to simplify how customers can securely share and synchronise data across AWS and Salesforce services. This year’s Dreamforce has seen 171,000 registered attendees from 83 countries, and 10 million online viewers, across 2700 sessions.